Apple, Apricot, Peach, Pear, Plum, Persimmon and Nectarine. Comfrey is a large plant that tends to crowd out its neighbors. Start seeds indoors or sow them where you want them to grow, or start with a purchased plant. New growth emerges in mid-spring, followed by flowers that attract pollinators in early summer. Comfrey is a fine source of greens for composting. When the large plants are cut back in summer, old branches are quickly replaced by a fresh flush of foliage. Roots to be used to make medicinal ointments or skin creams can be harvested at any time, but preferably in early winter. Gather greens for composting in early summer and again in the fall. 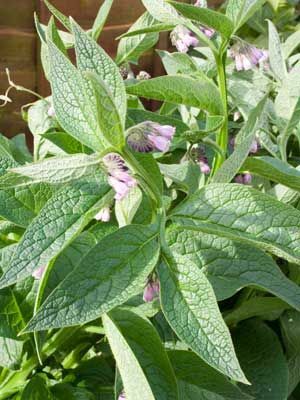 For medicinal use topical preparations made from comfrey roots are traditionally used to promote healing of sprains and broken bones by increasing circulation to the affected area. Taken internally, comfrey contains compounds that may harm the liver.